As QDN’s Chairperson, I would like to congratulate QDN members, Board of Directors, staff and supporters on our very successful AGM. Thank you to everyone who attended and contributed at the 2018 AGM with our highest number of attendees to date. At the AGM, we thanked our retiring Directors, Philia Polites, Matthew McCracken and Grahame Robertson. All three Directors have given great service to QDN’s Board and to the organisation. I thank them for their contribution, time and strategic oversight and the wisdom, and perspectives each has brought to our Board. We welcome the re-election of Peter Gurr, Gary Matthews has moved from being an appointed Director to an elected Director and the election of new Directors Hayley Wesbro and Des Ryan. After the AGM the Board met and re-elected myself as Chairperson and John MacPherson as Deputy-Chairperson. The Board has also voted to elect the chairpersons of the two sub-committees that operate to fulfil QDN’s responsibilities and governance structure of the Board. Gary Matthews was elected as Chairperson of the Audit and Compliance Committee and Des Ryan has been elected as Chairperson, Nominations and Performance Committee. I look forward to working with the new Board, and continuing the work to deliver on QDN’s current contracts and build new opportunities for the future that align with the vision, mission, values and goals of the organisation. Members will note information in the ebulletin below about the review of the Disability Services Act 2006. This is a very important review, and will shape the responsibilities and obligations of the Queensland State Government in regards to people with disability into the future. Whilst I note that a very short timeframe has been given for this consultation, which unfortunately impacts upon people’s time and capacity to be able to respond, QDN is putting forward a submission reflective of member feedback. I am aware of a number of members who have put in individual responses also and thank you for your time in having a say. QDN sees that the Queensland Government has an important role and responsibility in delivering and funding essential accessible, affordable and quality Government and community mainstream services to people with disability, and its critical role in fostering full inclusion and participation of people with disability in the economic, social, civic and cultural life of Queensland. QDN Board Directors: John MacPherson, Nigel Webb, Hayley Wesbro, Sharon Boyce, Colleen Papadopoulos, Peter Gurr, Gary Matthews and insert Des Ryan. To achieve these outcomes, the legislative reform must have mechanisms in place to require all Government agencies and departments to measure, report and comply with requirements which deliver on these fundamental rights to be able to access mainstream and community services just like anyone else. It is my view that there needs to be a central oversight point within Government for this, and it needs to be given significant prominence and weight in terms of its powers of accountability, monitoring and compliance, and a educative function to people with disability and the broader community. I believe it is critical that there is a lead agency who has sole responsibility with the focus on people with disability and the agenda of inclusion. I think without this sitting somewhere with legislative powers to oversight and monitor, and take action where required, we run the risk of losing ground on some of the positive work and outcomes that have been achieved in the past decades. I would like to echo Nigel’s thanks to everyone involved in QDN’s recent Annual General Meeting. It was very well attended and serves as a testament to the outstanding work, commitment and vision of many members, staff and allies and supporters. There is a significant amount of activity happening in the housing space at the moment. As members would be aware QDN has been leading the charge with our Going for Gold: Accessible, Affordable Housing Now and continues to work with Government, Non-Government Providers and community. Housing covers all forms of arrangements across rental and ownership. The Opening Doors to Rental Reform in Queensland is currently open and consulting with people across the whole state. QDN has 4 key principles developed by and for people with disability to guide our work. The 4 principles are Rights, Inclusion, Choice and Control. QDN, as part of the Queensland Fair Rent Alliance is seeking changes around a whole range of areas to make renting fairer for Queenslanders, including people with disability. People with disability represent a significant proportion of the rental market across both private and social. While there is no collected data for Queensland statistics around the market profile for people with disability, data suggests that renting by people with disability makes up a significant proportion of the renters in this state, making it a critical issue for the 900,000 Queenslanders with disability. QDN is supporting a number of key issues including giving people the right to stay in their rental homes by removing ‘no reasons’ for evictions and ensuring that ‘just cause’ reasons have to be part of eviction notices. QDN also believes it is important to keep rents fair so people can stay in their homes. For people on a fixed income, rental increases can mean that other essential bills like food and energy get adjusted. QDN supports that rent increases should be limited to once a year, and if rent increases are more than 20% over CPI, then this increase should be justified. The Australian Building Codes Board is also currently consulting on regulations about standards for buildings. Universal Housing Design is an important part of ensuring housing is accessible for everyone in our community, and QDN will keep members up to date about what comes out of this current consultation. I am also very pleased to report to members that QDN’s NDIS Peer to Peer Advocacy Project is operational, and is providing support and advocacy to people with disability and their family/supporters. The project is able to support people at any stage of their NDIS journey, from pre-access, making an access request all the way through to getting ready for planning meeting and even support and advocacy at the planning meeting. QDN has also been assisting people who have made an application and they have been denied access. The team are working with people to gather more evidence and information to provide to the NDIS, and participants have reported positive outcomes. I am pleased that QDN is able to work so far with so many people who have never received formal disability supports in their life before, and what a difference this is making in their lives. We welcome many new staff to the team. Peer to Peer Advocates: Jo Walters, Kylie Rogers, Stephanie Dower, Karin Swift, David Swift, Peter Tully and Peter Parkes. We also welcome Angela Boyd, Kate Burton and Leigh-ann Elliott to the team in the office. 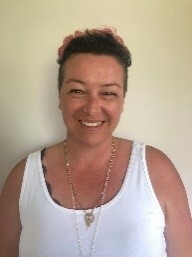 On another note Lisa McDermott who has been working in the Getting on the NDIS Grid project has moved on to take up another opportunity within the NDIS landscape. QDN’s Annual General Meeting was held on Saturday 3 November 2018 with over 50 people in attendance. We acknowledge the tireless efforts of retiring Directors, Philia Polites, Matthew McCracken and Grahame Robertson. The Board play an important role in setting the strategic direction of the organisation and the governance. In these changing times, this requires a great deal of thought, consideration and planning. Please find information below about the elected Board and positions including the two sub-committees of the Board. 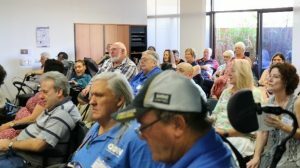 Over 50 people attended the 2018 AGM. Members enjoying a chat and lunch. The 2017-18 QDN Annual Report is available on our website here in screen, Word and pdf versions. Through investment from Community Services Industry Alliance (CSIA), QDN has created an easy English booklet, based on work produced by The Australian Centre for Social Innovation. 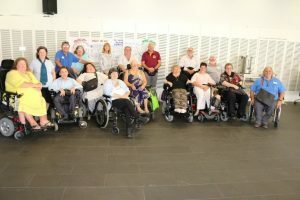 The group of 10 self-advocates who have been working together with the support of QDN, Community Living Association, WWILD-SVP, Parent to Parent, Aged and Disability Advocacy Australia, and Queensland Advocacy Incorporated have worked together in 2018 around key goals and objectives for self-advocacy. The group worked together with Ingrid Burkett from the Australian Centre for Innovation to explore ways of making a theory of change access for people with intellectual disability. Theory of Change is the underpinning framework used by the NDIS for Information, linkages and capacity building (ILC) for developing and delivering on projects and reporting on outcomes. This easy English booklet is for people with intellectual disability who want to speak up to make positive changes in their communities. The easy English booklet can also be used by organisations, supporters or people who want to support people with intellectual or learning disability so they can work together, on a Theory of Change. This could be to respond to an idea, a challenge or to design a project. This approach aims for genuine engagement with people with disability by building in their active participation early in the project. Click here to read the easy English booklet. QDN was pleased that so many of our members were able to attend the 2018 ASID National Conference on the Gold Coast between 14-16 November. 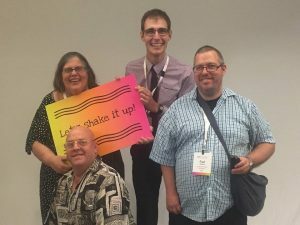 The Conference theme was “Let’s shake it up: Human Rights for everyone.” QDN members were part of a focus group of self-advocates who brainstormed important themes and issues for people with intellectual disability, and came up with a number of recommendations to the National Board of ASID for Conference Themes. “Let’s Shake it Up: Human Rights for Everyone” was the one that was chosen. QDN was also pleased to be involved in three presentations at the conference. grow their knowledge and understanding about research and practice. QDN thanks members who provided direct feedback to this work and will share links to these responses shortly. Please see below for more detailed information. As Queensland transitions to the National Disability Insurance Scheme (NDIS), the Queensland Government are reviewing the Disability Services Act 2006 to ensure there are laws in place to reflect the changing landscape of how supports for people with disability are funded and delivered across Australia. 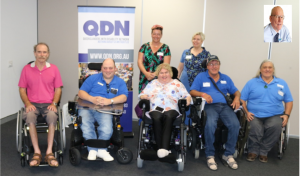 QDN sees that the Queensland Government has an ongoing and important role in ensuring the rights, inclusion, access and participation of 900,000 Queenslanders with disability. Whilst the NDIS supports 10% of Queenslanders with disability, there is also an accountable role for state governments in the stewardship and governance of all portfolios to deliver accessible, quality, timely, safe, and affordable services and supports across all areas of the mainstream government and community services. QDN also sees an important role for state government to provide people with disability who are not eligible for the NDIS the services and supports they need to socially and economically participate in their communities and meet their fundamental needs for support to live their lives. QDN sought the input of QDN members on the proposed changes to the Act and has put forth a submission. We will keep you updated. The Commonwealth Department of Infrastructure, Regional Development and Cities is conducting the third review of Disability Standards for accessible public transport. The purpose of the Transport Standards is to support public transport operators and providers to remove discrimination from public transport services by providing specific details about the standards they need to meet. The Standards are required to be reviewed every five years. QDN has made a submission to this Review and thanks members who contributed their perspectives and stories of using public transport to inform our response. Thanks also to members who made submissions in their own right. Give people the right to stay in their rental homes. Keep rents fair to keep people in their homes. Make it easy for people who rent to get their bond money back when moving. Make sure that people who rent their homes are treated fairly and with honesty. Keep people together with their pets in their rental homes. Enforce basic standards for rental homes. Protect people’s privacy by making sure that they have fair warning before someone enters their homes. The Australian Building Codes Board (ABCB) has released the Accessible Housing Options Paper and planned a series of National Consultation Forums for a national Regulatory Impact Assessment (RIA) regarding accessible housing for private residences. Click here to read more and to find a consultation in your area or click here for extra information. Queenslanders will soon be protected under a Human Rights Act after a bill was tabled in State Parliament yesterday. Consultation on the bill was open until 26 November 2018. QDN CEO Paige Armstrong said “A Human Rights Act for Queensland has been an important campaign and a reflection of what can be achieved through a grass roots movement of collectively coming together and saying this is important and we need to see this change. Human Rights is the foundation of our work at QDN”. Click here to read more. The Changing Lives Changing Communities events in Toowoomba, Mackay, Caboolture, Brisbane, Gold Coast, and Normanton are funded through Information, Linkages and Capacity Building (ILC) National Readiness Grants – National Disability Insurance Agency (NDIA) – a partnership between QDN, QCOSS and ADCQ. There are another 7 forums that are being held and the QCOSS Board has also approved new investment in these seven events, representing a very real commitment by QCOSS to drive change across Queensland communities. QDN is partnering with QCOSS on these events too. QDN and QCOSS along with partners ADCQ and the Toowoomba Regional Council and Mackay Regional Council were pleased to be able to hold the forums in Toowoomba and Mackay communities in October. In each region, community is exploring the question “What will it take to create a community where everyone contributes, matters and belongs?” The question is framed on the key elements of inclusion, and the 2 days focus on sharing individual and community stories of inclusion, engaging in conversations about what is working and what is needed, and co-designing solutions that are important for each community. On 10 and 11 October, over 80 participants from the Toowoomba community came together to explore the question and generated 13 ideas and projects that were co-designed and developed on day 2. On 17 and 18 October, over 70 people came together in Mackay and generated 9 ideas and projects. The co-design of the solutions is shared and all reflect innovative ideas and approaches to increasing the inclusion of people with disability and the broader community across areas such as education, housing, tourism, business, transport, recreation, civic participation and access and inclusion more broadly. QCOSS continues to lead the events in other communities, continuing the momentum of Movement for change and QCOSS Pulse conversations. They have held forums in Capricornia, Fraser Coast, Townsville, Cairns and Mt Isa across August – November. Minister O’Rourke is hosting forums in a number of locations around Queensland to hear locals’ experiences with the NDIS and to find out how the Palaszczuk Government can further support people with disability to access the scheme. QDN Board Director, and Chairperson of Queensland Disability Advisory Committee Sharon Boyce co-hosted the Toowoomba forum with the Minister on 4 October 2018. The Auditor-General’s report Access to the National Disability Insurance Scheme for people with impaired decision-making capacity was tabled in the Queensland Parliament on 27 September 2018.
assisting potential participants who are hard to reach to engage with the NDIA. The Coalition Government established the National Disability Insurance Scheme (NDIS) Fraud Taskforce in July to tackle potential fraud against the NDIS. Today we can announce that the Taskforce has made a significant arrest. A 34-year-old Victorian man has been charged for allegedly defrauding the NDIS of more than $400,000. Click here to read more. The NDIA is piloting the use of functional impact assessment tools with participants aged over seven years with a diagnosis of Autism Spectrum Disorder, intellectual disability, or psychosocial disability to help determine the impact the disability has on their capacity to participate in community, work and/or social activities. The NDIA hopes the pilot will “improve consistency, accuracy and reliability in decision-making, delivering fair plan outcomes and access decisions for all participants.” The functional impact assessment will form part of the supporting evidence the NDIA considers when making its decisions. Participation in the pilot will be voluntary and free of charge. In New South Wales, it will be offered to people who have applied for the NDIS but have not been assessed for eligibility, or, people who have applied for the NDIS and have had an ‘access met’ decision but do not yet have a plan. It will run until February 2019. Queenslanders with Disability Network (QDN) welcomes the announcement of a Royal Commission into Aged Care, and that the Royal Commission will include people with disability who live in nursing homes. There are numbers of people with disability who reside in nursing homes, including young people, due to a lack of other accommodation options available to meet their support needs, and it is critical that they will also have their voices heard through the enquiry. The human rights of all Australians must be upheld, and older Australians have the right to quality, safe, affordable and accessible services and supports. Click here to read more. The Prime Minister Scott Morrison delivered a National Apology to victims and survivors of Institutional Child Sexual Abuse on Monday 22 October 2018. View the Apology here. A Toowoomba disability advocate and QDN member Josh Marshall is on a mission, to get local cafes, restaurants, and hotels, to think about accessibility. Josh Marshall developed a rating system, encouraging businesses to make small, but significant changes. Click here to read more. Or on paper by completing a form and returning it by mail. Forms will be available in 2,385 rural and remote Australia Post outlets, through 146 Aboriginal Community Controlled Health Organisations and in 136 prisons. The Palaszczuk Government has opened the door for leading medical research institute QIMR Berghofer to develop better treatments for patients with multiple sclerosis. Click here to read more. The Australian Government’s $33 million Boosting the Local Care Workforce Program takes a major step forward with the appointment of its first group of regional and specialist coordinators. Cick here to read more. Missed the Accessible Housing National Consultation forums? QDN and several QDN Housing Champions attended the Brisbane Forum on 29 October, 2018. Submissions closed 30 November, 2018. A video recording of the forum is now available here. Queensland renters deserve the right to have a place to call home – make renting fair! Queenslanders with Disability Network (QDN) is one of 12 community based organisations who form the Make Renting Fair Alliance today (October 25 2018) launching the “Make Renting Fair” campaign. It gives a voice to Queensland renters, and is calling for better protections to all people living in rental properties, including people with disability. For more information on Make Renting Fair Queensland or to share your rental story, click here. North Queensland builder Martin Locke has been pushing for Townsville to become a pilot city where all new homes are built to a silver level standard, to meet the needs of Australia’s growing populations of older people and people with a disability. Click here to read more. The NDIS Peer to Peer Advocacy team is continuing to work with individuals (and their supporters) to support and advocate for people making access to the NDIS, getting ready for planning meetings and at the planning meetings. QDN is also getting a lot of calls for support from people who have had their NDIS access request denied. 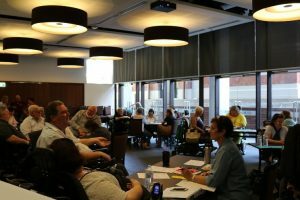 In this final 7 months of transition to the NDIS, it is critical that everyone who is eligible or who believes they are eligible can get the support and assistance they need to make an access request, and get ready for their planning meeting and if they want, have someone with them at their planning meeting. QDN Members and people with disability and their families have told us that making an access request is not always straight forward for people, and that many people need 1:1 support and assistance in making an access request, and then moving along the NDIS pathway. 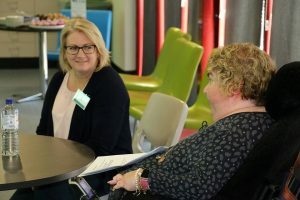 One recent Peer to Peer Advocacy participant said that she has a better understanding of the NDIS process and project advocates took the time to listen to her, allowing space to work through the pre-planning process at her pace. QDN’s service is free. Please call QDN and we can organise to meet with you and work with you on your NDIS journey. The Getting on the NDIS Grid project continues to connect with people with a lived experience of disability and who may be experiencing further disadvantage, for example, homelessness, living in Supported Accommodation, exiting Child Safety, Juvenile Justice or Corrective Services. For some people the only support they may have is from their local Community Centre, or service staff who connect with the caravan parks or Supported Accommodation where they live. 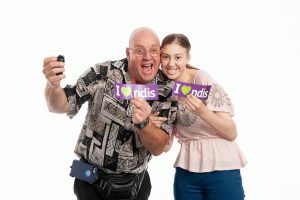 QDN Getting on the NDIS Grid project continues to work closely with people supporting them to increase their knowledge about the NDIS through fun and interactive activities. Since July 2018 the project has connected with over 1200 people. 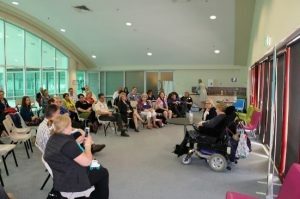 The project team will continue to link with people from as far as the Gold Coast to the Sunshine Coast and facilitate NDIS understanding and learning. Group Convenors from across the State came together in a Community of Practice on Friday 2 November in Brisbane. For some Convenors, this was an opportunity to meet their peers for the very first time. Michelle Moss facilitated the day through a Theory of Change process. The process highlighted the amazing skills that Group Convenors have acquired over the years and their ongoing dedication to their local groups and communities. 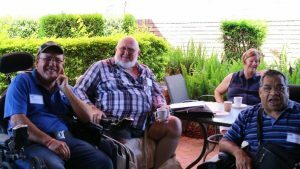 They continue to maintain groups in Queensland for people with disability to meet and share their experiences, and engaging in issues of shared importance. 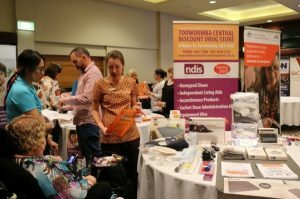 One Group Convenor who attended the day shared feeling quite nervous about the outcome of their personal NDIS plan, but was immediately put at ease when fellow Convenors shared their stories of their own journeys in negotiating the NDIS. “This is the magic of these groups”, she said. By the end of the day the group had clear goals around ideas for future projects. When a local interpreter was not available for the Cairns Local Support Group, the group successfully linked up with an interpreter from Brisbane using Skype. This innovative thinking enabled a group member to fully participate in the meeting on the day. Using technology such as this shows what is possible linking and connecting with others in our communities, as well as linking with other groups. QDN member from Brisbane, Mathew Townsend has created this vlog on the importance of plastic straws for people with disability. Well done, Mathew. Watch the vlog here and watch out for further vlogs from Mathew. I am a proud Aboriginal woman, and I’ve raised 3 fantastic humans. I’ve made my career in the Community Services sector and found that in each posting I’ve had, I’ve learned new skills in working with people and also new skills for living my own best life. What draws me to working with people is the complexity of life situations, the links between behaviours and environment and the most wonderful ability of people to change their lives. I always feel blessed when I work with someone who is struggling in their life, and I can support them to identify the root cause of their struggle and devise a plan to resolve. To be part of a person’s journey is a privilege and fills my soul with love, motivation and passion to continue to do good! And like all people, I have my struggles. I have lived with Bi-polar II disorder for many years, and I recently received a Neurological disorder diagnosis, which sees me experience non-epileptic seizures brought on by various triggers. What would you say most motivates you to volunteer as a QDN elected director of the board? My one small voice can effect change…. on a small scale. I’d like to add my small voice to the louder voice which is QDN, and support the organisation to effect change on a large scale. I feel that it is imperative for our demographic of people to have the QDN support network, in order to achieve equity in the community. I am honoured to have the opportunity to be part of the Disability movement and particularly to be part of the current reform and transition to NDIS. What are three important things you think need to happen for people with disability to participate more socially and economically in their communities? Relationships: dating services and supports to promote equitable opportunity to develop loving and intimate relationships including sexual relationships. What does the Office of the Public Guardian (OPG) do? The Office of the Public Guardian (OPG) have just released an explainer video about their guardianship system and how they can help protect adults with impaired decision making capacity. Watch it here. What does impaired decision making capacity mean? What kinds of decisions does a guardian make? How do we make decisions at the Office of the Public Guardian? You can view our other explainer videos on our Youtube channel here, and on our new website here. Disability Law Queensland (DLQ) is a non-profit law firm that assists people with disability and their families to plan for the future, assert their rights and access justice. Click here to find out more about their work.